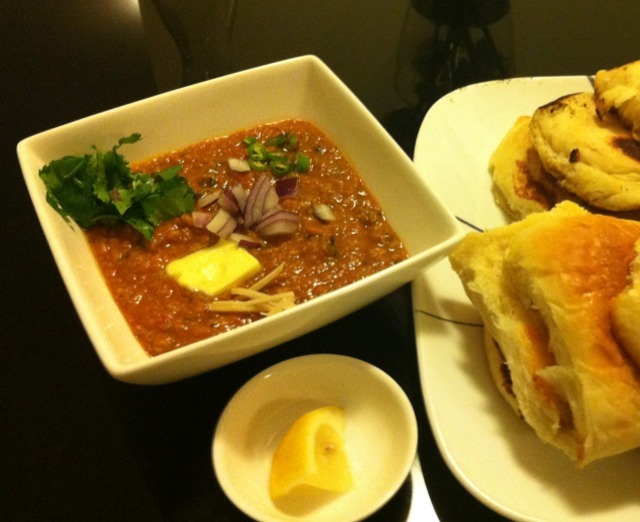 Anyway, I thought I’d prove him wrong, and inspired by this video, I set out to make the best Pav Bhaji down-under. I even made the Pav, and will post the recipe in another post. Normally the vegetables are cooked down and then mashed by hand. I thought I’d speed up the process, so I start by chopping all the ingredients in (a) in a food processor to make a paste. Pour this mixture into a pan and cook with a lid on until the vegetables are tender and the mixture darkens slightly. In a second pan, heat butter, add all the other (b) ingredients and fry until a thick paste is formed. Add this to (a), stir well, cover with a lid and cook well. After about 20 minutes, remove the lid, let the mixture thicken, and cook until the oil separates from the mixture. Finish off with a squeeze of lemon. Split the buns in half, heat a pan, drop some butter into the pan. Once the butter has melted, fry the buns on both sides until slightly crisp. You still want them soft, so don’t toast them too much. Serve the buns on the side, the Bhaji in a bowl with desired toppings and a good dollop of extra butter. Enjoy!